Guerrilla Warfare is a type of combat used mostly when the enemy has a larger military than you do. It has several meanings. It can be using a sniper to pick off enemy military troops or the use of surprise raids, ambushes, sabotage etc., by small, mobile groups of forces against an enemy military. It is also a type of combat that's fought by a civilians (people not in the military). Often, guerrilla warriors are attempting to overthrow an existing government or are rebelling against or fighting a much larger, organized military. Many times, guerrilla warriors are fighting in their homeland or they have the support of the local population. Therefore, guerrillas are usually familiar with the terrain and landscape, and they use this to their advantage in their attacks: the enemy has no idea what's happening until the guerilla attack is underway. The word guerrilla means "little war" in Spanish. The term was first used during one of the Napoleonic Wars when the British enlisted Spanish and Portuguese guerrillas to help them fight the war. HOW WAS GUERRILLA WARFARE USED IN WORLD WAR I? By World War I, guerrilla warfare was beginning to fizzle out and would not make a come back until after World War II. Two distinctly different types of guerrilla warfare were used in World War I. The most well-known use of guerrilla warfare was on the Arabian peninsula, where, under the leadership of T. E. Lawrence and Faisal al-Husayn Arab guerrilla bands fought a much larger, stronger, and better armed Ottoman Empire. 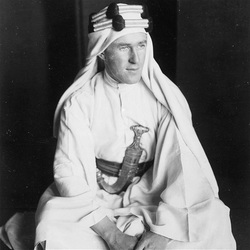 The movie Lawrence of Arabia was made about T.E. Lawrence and his use of guerrilla warfare to free the Arabs from the Ottoman Empire. Another way guerrilla warfare was used in World War I was using a sniper. A sniper is a expert military gunman who shoots over long distances from a hidden place. 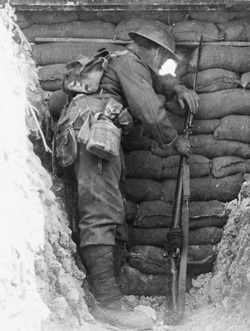 Throughout World War I, snipers were often used in the trenches in an effort to take out enemy soldiers as their heads peered over the top of the opposing trench. At the start of WWI, only Germany issued scoped rifles to their troops. The scopes combined with their intense training, made them the deadliest and most efficient sharp shooters during the war. The Russians did not have very many snipers, so this allowed German snipers to easily execute Russian soldiers because their was no fear of a Russian sniper tagging them. WHY WAS GUERRILLA WARFARE USED IN WORLD WAR I? Guerrilla warfare was used by T.E. Lawrence to free the Arabs from the Ottoman Empire because the Arabs were not formally trained soldiers, had fewer men, and fewer, less advanced weapons than the Ottoman Empire did. By hiding, picking off troops in formation, and moving around often, T.E. Lawrence and the Arabs were able to defeat the much larger Ottoman Empire. Snipers were used to break the stalemate. They were used mainly as patrols, hiding amongst the back ground, often in no mans land or enemies areas. Snipers would try take out the enemy's senior officers. This created confusion because it left the soldiers without a chain of command. Using snipers was also a type of psychological warfare. Psychological warfare is when you try to bring down your enemy's confidence and morale. The constant fear of snipers and bombardment with bullets and bombs caused soldiers to suffer from shell shock. Shell-shock was a mental illness caused by long periods of time fighting in a war. Symptoms included fatigue, tremors, confusion, nightmares, and problems with sight and hearing. There were many advantages to using Guerrilla Warfare. Guerrilla Warfare allowed smaller, less experienced, and poorly supplied troops to defeat or severely damage large, experienced, and well supplied enemy troops. Many times guerrilla fighters were fighting the war in their homeland. Guerrilla warfare allowed the military to take advantage of civilian help. It also was an advantage because they knew the layout of the land, where the enemy had to rely on maps and planes. There were also disadvantages to guerrilla warfare. If the guerrilla attacks are slow or poorly organized, enemy troops can end a guerrilla raid quickly. Because guerrilla warfare relies on moving constantly, it was hard to have a base to meet up and strategize. If sniper escape routes are blocked off or become occupied by heavy enemy troops, it leaves the sniper trapped and more likely to be captured. Finally, if the guerrilla force or sniper is forced to stay in one general area for a long period of time, they could run out of supplies and ammunition.